Sevmash Shipyard will no longer be producing vessels and equipment for the civilian market, but exclusively focus on submarines and naval vessels. The enormous amount of states orders on military equipment has made Sevmash Shipyard give up all production of non-military products. The huge Sevmash Shipyard in Severodvinsk outside Arkhangelsk is Russia’a only manufacturer of nuclear-powered submarines. Since 1939 the shipyard has constructed 45 surface vessels and 168 submarines, 132 of them nuclear-powered, the shipyard’s website reads. Sevmash has also been producing mega yachts and other vessels for the civilian market, as well as equipment for offshore oil and gas production, the most important being the “Prirazlomnaya” platform for Gazprom. “We have handed over all non-core projects to other shipbuilding plants,” a source at Sevmash said. “The floating nuclear power plant we have handed over to the Baltiysk Factory in St. Petersburg. 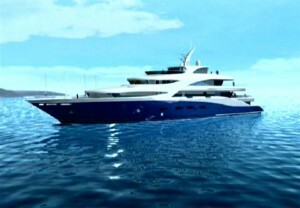 We have finished production of hulls for luxury yachts of the 113A series. The factory is fully concentrated on fulfilling the state military orders,” Murmanskiy Vestnik reports, citing Izvestiya. The source added that the shipyard is still providing warranty support to “Prirazlomnaya”. Sevmash has capacity to build up to six nuclear-powered submarines at the same time. Right now the shipyard is busy building “Borey” strategic submarines and “Yasen” multirole submarines. The Russian Navy has ordered eight “Borey” submarines by 2020. The two first vessels have been delivered to the Navy. “Yury Dolgoruky” is in service in the Northern Fleet, while “Aleksander Nevsky” is in service in the Pacific Fleet. The third vessel, “Vladimir Monomakh” is undergoing state tests, while the fourth and fifth ones – “Knyaz Vladimir” and “Knyaz Oleg” are under construction. The two last Borey-class submarines will be laid down in 2017 (“Generalissimus Suorov”) and in 2018 (“Imperator Aleksander III”). Sevmash plans to build seven Yasen-class submarines by 2020. The first vessel, “Severodvinsk”, is already in service in the Northern Fleet. The three next vessels “Kazan”, “Novosibirsk” and “Krasnoyarsk” are in different stages of completions. The Yasen-project is one of the most secretive and expensive in the program for development of the Navy, and in the state armaments program as a whole, Murmansk Vestnik writes. All control systems and components are completely new, and the submarines are equipped with high technology never used before in Russian or Soviet shipbuilding. According to Murmanskiy Vestnik, a submarine of the Borey class costs about 23 billion rubles, while a Yasen-class sub costs nearly ten times as much.